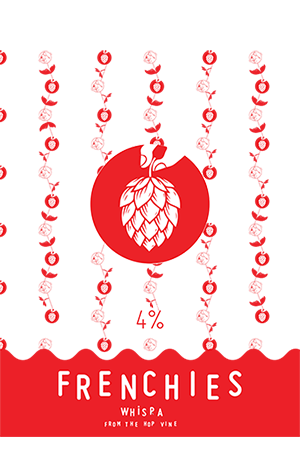 Following this year’s hop harvest, the team from Frenchies corralled a dozen or so fellow brewers into each brewing a beer using fresh hops, then hosted something of a collective launch party under the banner of the Fresh Harvest Beer Festival. The Frenchies’ contribution to the occasion was and is a Wet Hopped India Session Red Ale, which gets shortened to the far catchier name WHISPA (or the marginally less catchy WHISRA, if we’re splitting hairs and paying attention to the faded fine print on the can). The fresh hops they threw in were Tasmanian Enigma, Galaxy, Ella and Cascade and these combine to give some gentle citrus and pine, a light pepperiness and a hint of earthiness. Notably, they also give it a fat, oily sensation on the palate, which lends the whole beer a more fulfilling feeling than you might expect if it was made with hop pellets. All that being said, for a beer where the fresh hops provide the marketing hook, it's our less fashionable old friend malt that really defines it. The three varieties they’ve used, all from NSW maltster Voyager, are responsible for the lovely mahogany colour, a pleasing touch of sweetness and a fairly full body for a mere 4 percent ABV beer.